Posted by Lorea Thomson on Wednesday, August 30th, 2017 at 12:13pm. The natural ocean ecosystems have been brutally impacted by years of coastal development. The decrease of eco-habitats has impacted marine life and coral reefs. Coral reef development occurs only in areas with specific environmental characteristics: a solid structure for attachment, relatively warm water temperatures, clear waters low in phosphate and nitrogen nutrients, and moderate wave action to disperse waste and bring oxygen and plankton to the reef. Creating new habitats will counterbalance the pressure placed on natural reefs. If you have an interest in safeguarding the sustainability of our local marine environment consider supporting the cause. 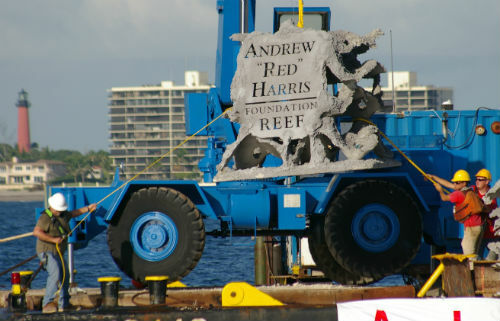 For more information, please visit the Andrew "Red" Harris Reef Foundation.